Today, I had the great opportunity to welcome Erik Groset as a guest speaker to my Creativity, Innovation, and Entrepreneurship course. As you may recall, Erik is a recent graduate of Cal State San Marcos and was a finalist for the Wired Small Biz contest [video below] for his invention of the LiveSpeakr. Erik carved out a substantial bit of time for us today and shared with us his experiences of developing and refining the LiveSpeakR over the past year. His topics included the genesis of the LiveSpeakR, the stages of product development, the challenges of choosing a manufacturer in another country, and a variety of other relevant topics for my students and I to consider. 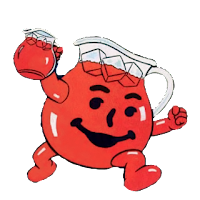 I particularly enjoyed learning about his former entrepreneurial ventures as a professional Kool-Aid salesman. He described how he'd go to construction sites (as a child) and offer jugs of Kool-Aid for $10. "The smart ones," he said, "were the guys who'd want it for $5, then I'd agree on $7." He went on to say that many of his customers were just happy to have Kool-Aid from an enterprising kid and were willing to pay the $10 he was asking for. What did he get from all of this? Some serious cash for a youngster and the koolest (spelling is intended) Kool-Aid Bomber Jacket from all of the Kool-Aid points he'd redeemed. This guy just oozes entrepreneurship. I love it! Erik finished the presentation by sharing with us some life lessons he's learned. All of these were excellent, but there was one that caught me by surprise. He said to "ABU...always be upgrading." I'm interested to hear what your thoughts on this might be. What would that mean to you? All in all, he just shared honestly and openly about his experiences as a true-to-life student turned entrepreneur and I am so proud of him. He really is doing a great job in a very competitive marketplace. If you're reading this, Erik, kudos to you and your team!